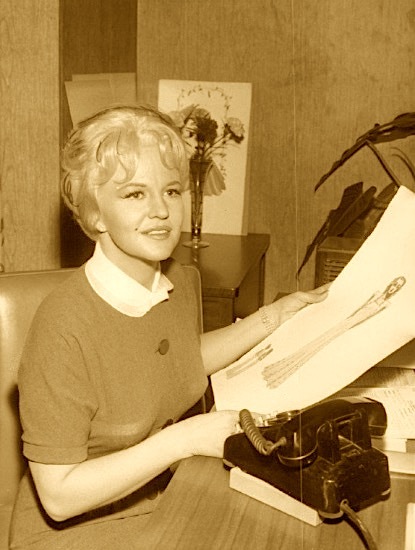 This page is dedicated to vocal work that Peggy Lee did primarily for the cinema. 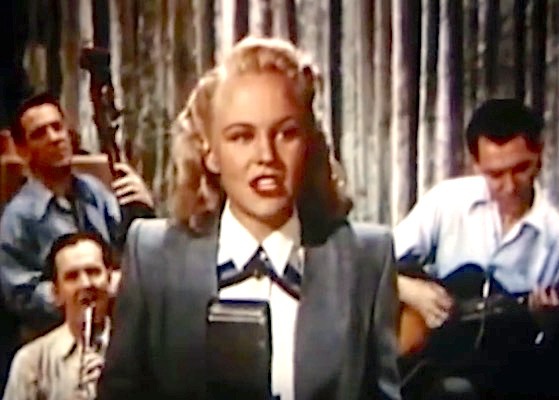 Each entry concentrates on a movie in which she was seen singing. The entries list both visual releases (VHS, DVD, laser disc) and aural ones (CD, LP, etc.). There is also a miscellaneous TV section at the end of the page. (Most of those TV roles were straight dramatic parts, featuring no singing. 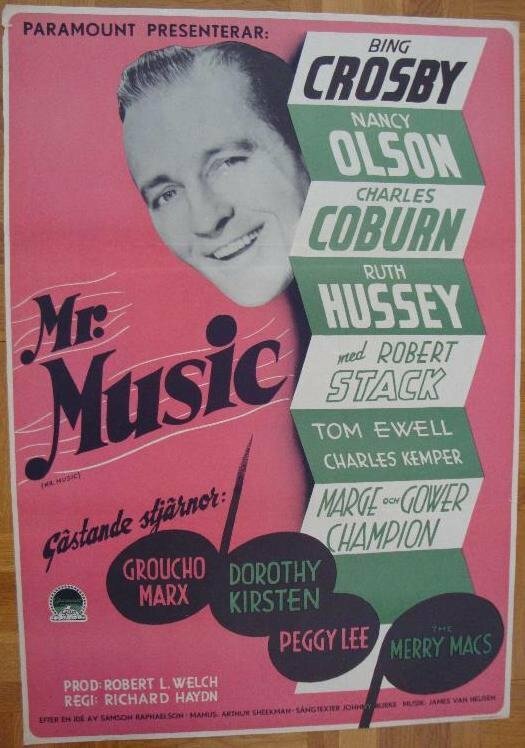 The early Hollywood roles are, on the other hand, mostly singing parts. 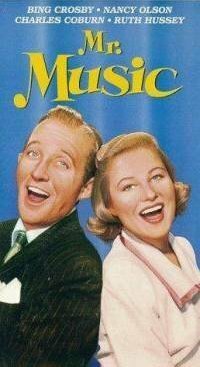 Later film roles combine acting with singing.) As for flicks in which Lee is heard but not seen singing , consult the pages for movie soundracks and animated films. 5 - 7. 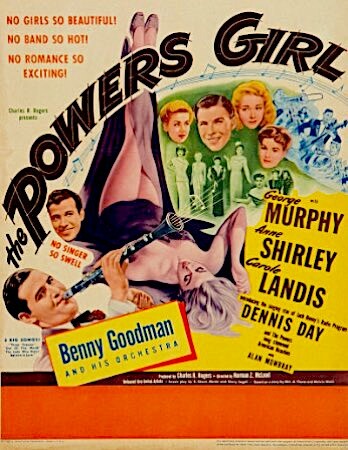 Title: The Powers Girl / Note: Image #5 is from a movie scene in which The Benny Goodman Orchestra plays an instrumental number; also seen in the image is actor Dennis Day, the film's male lead. 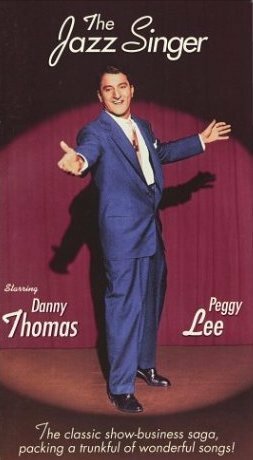 A professional vocalist as well, Dennis Day actually sings two numbers in the film. 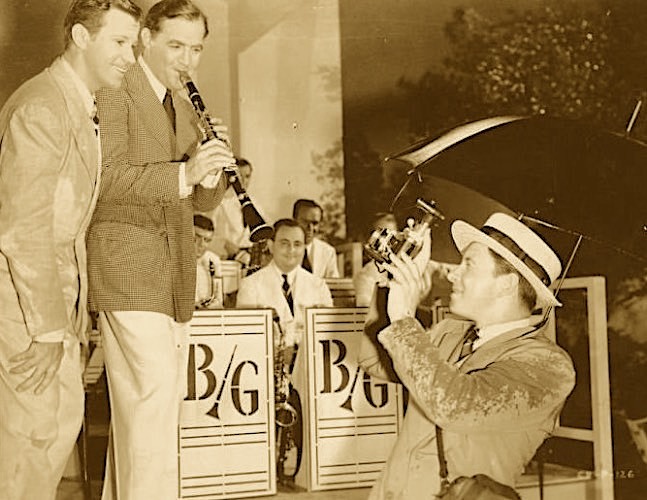 Lee and the Goodman orchestra are said to have tried (rehearsed? filmed?) one of those two numbers, but ultimately Day was seen as the most suitable choice for the purposes of the movie's plot. 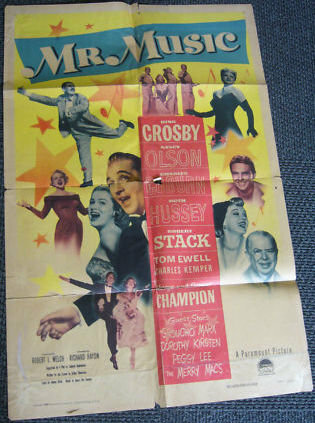 As for the other above-seen images (#6 & #7), they feature sheet music from the movie. 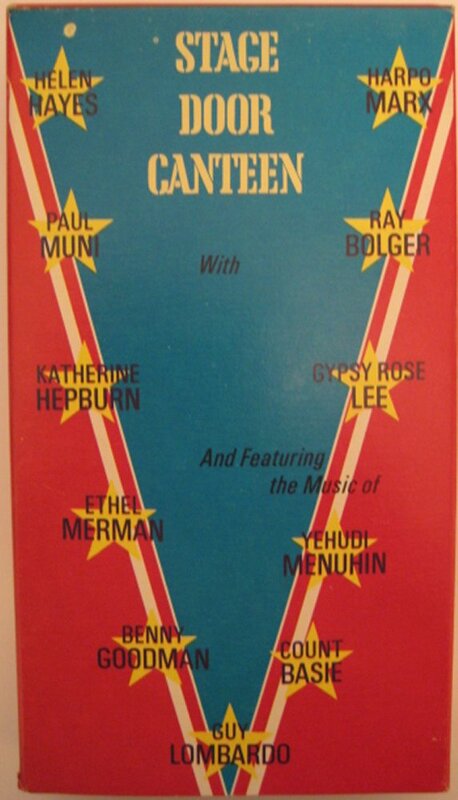 Regrettably, the sheet music for the Lee vocal, "The Lady Who Didn't Believe In Love," is barely visible, due to the blurriness of the only image available to me (#6). Fortunately, the same artwork can be used for "Three Eishes," another song from the film, and that's the artwork viewable in image #7. 8. 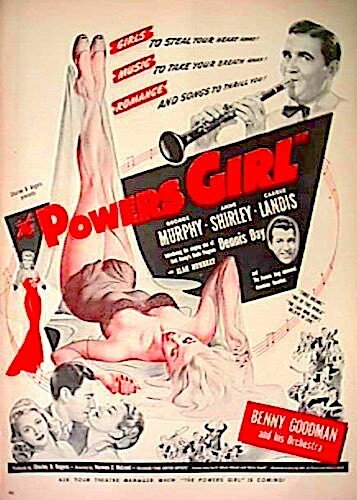 Title: The Powers Girl / Format: VHS / Label: King Of Video / Cat. Num. : unknown / Rel. 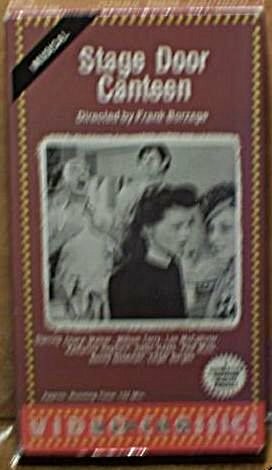 Year: unknown, possibly 1970s / Note: As of 2013, The Powers Girl has not been issued on DVD or in any other commercial format except this presumably low-grade VHS tape. 1-4. 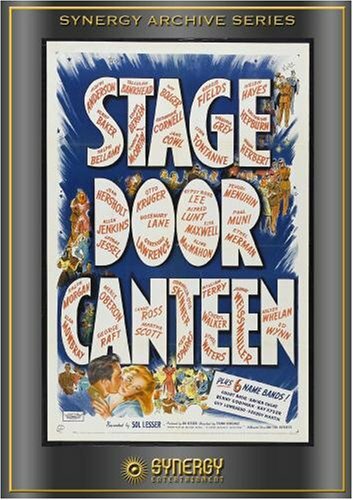 Title: Stage Door Canteen / Note: Backed by The Benny Goodman Orchestra, an unidentified Peggy Lee sang the hit "Why Don't You Do Right?" 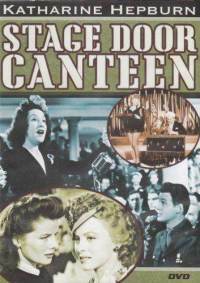 in Stagedoor Canteen, an United Artists movie filmed in December 1942 and released on June 24, 1943. The images displayed above show Lee and the orchestra during this iconic performance. 5. 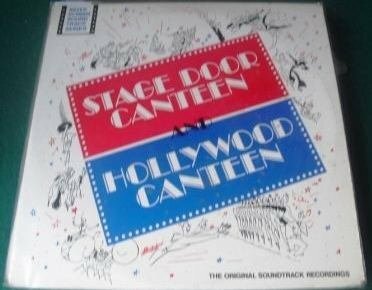 Title: Stage Door Canteen And Hollywood Canteen ("Silver Screen Soundtrack" Series) / Format: LP / Label: Curtain Calls / Cat. Num. 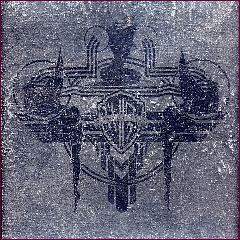 : 100 11 & 100 12 / Volumes: 2 / Rel. Year: unknown, within the 1970s / Note: Contains the soundtracks of the two eponymous movies, the first one inspired by a venue located in the East Coast. 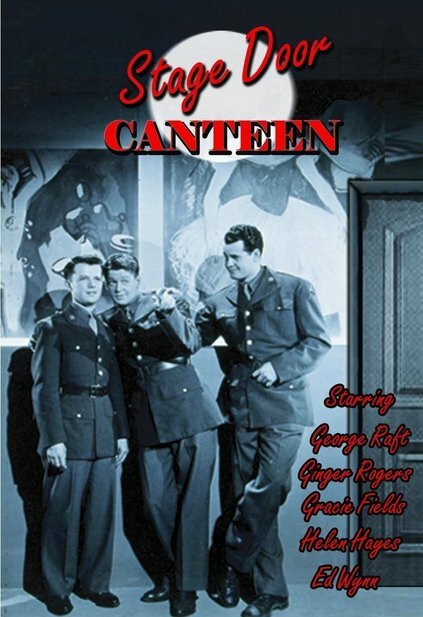 (The second movie, released by Warner Brosthers in 1944, was the West Coast's competition and answer to the first one.) 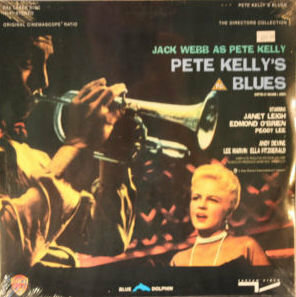 This LP set should not be confused with other similarly titled albums which contain either a Peggy Lee studio recording of "Why Don't You Do Right?" 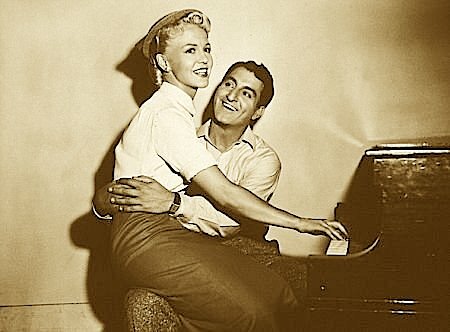 or no Peggy Lee performance at all. 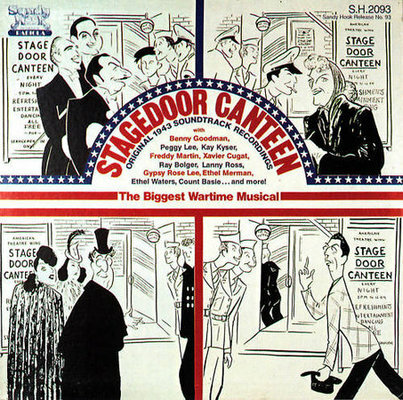 The two most widely distributed instances are Stagedoor Canteen: Music Of The War Years, Volume 1941-42 (Capitol, 1990, on both CD and cassette) and Heartland Music Presents Stagedoor Canteen (1987, CBS Records; a set of 44 recordings originally sold via mail order as 4 LPs, 3 cassettes, or 2 CDs): there are no soundtrack recordings in either of those nostalgia compilations. 6. 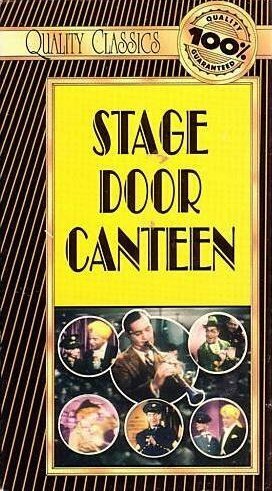 Title: Stagedoor Canteen / Format: LP / Label: Sandy Hook / Cat. Num. : Sh 2093 / Rel. Num. 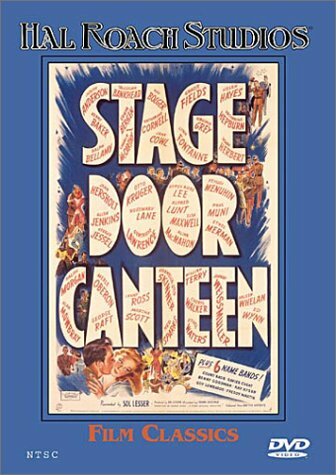 : unknown / Note: Like item #5, this LP set contains the entire original soundtrack from the Stagedoor Canteen film, including Lee's performance of "Why Don't You Do Right?". 7. 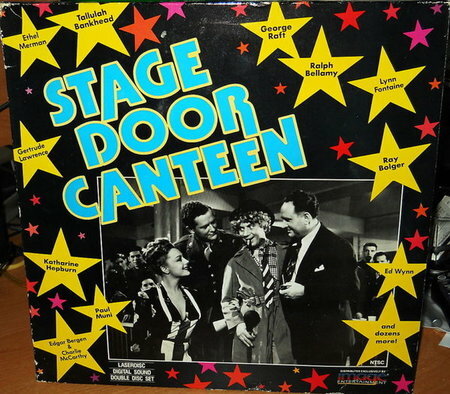 Title: Stage Door Canteen / Format: Laser disc / Note: Further details unknown. 8. 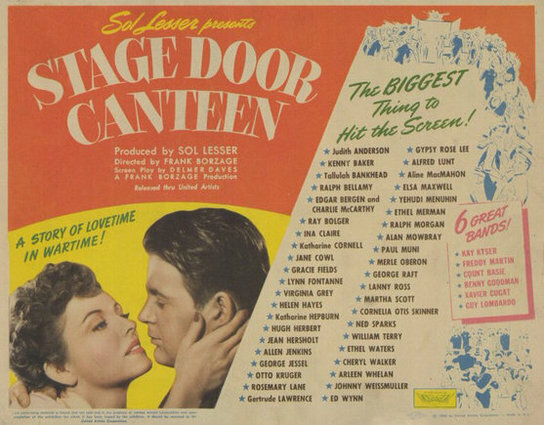 Title: Stage Door Canteen / Note: movie poster. 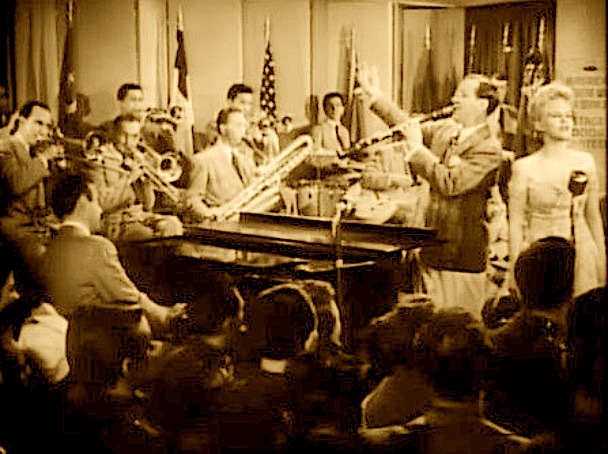 Names the 43 "stars" and the 6 "great bands" (Kay Kyser, Freddy Martin, Count Basie, Benny Goodman, Xavier Cugat, and Guy Lombardo) that participated in the film. 9-24. 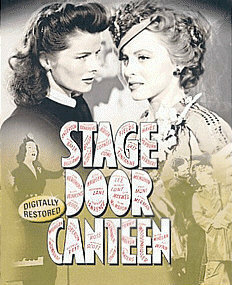 Title: Stage Door Canteen / Formats: DVD and VHS / Note: A countless number of Public Domain labels have issued this movie. 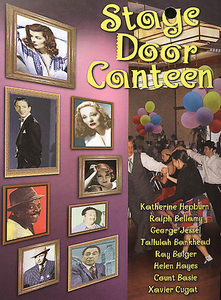 Eight DVD versions are shown in the first row above, and seven VHS versions in the second row. Those 15 versions are by no means the only ones in existence. I have come across about ten more, and do not doubt that there are also others of which I remain unaware. Since specifics about these items are hard to come by, I am listing below only those for which I currently have complete (or nearly complete) information. 24. Title: WWII: The Music Video / Format: VHS / Label: Unicorn Communications / Cat. Num. : 05410 / Rel. Year: 1989. / Note: This is just one of the many budget, Public Domain, various-artists video compilations that includes Lee's "Why Don't You Do Right?" 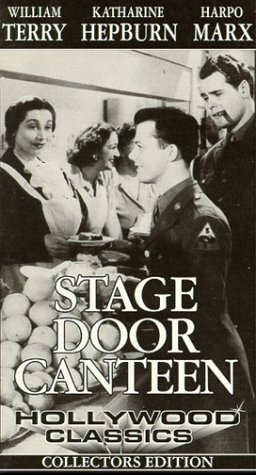 performance from the Stagedoor Canteen film. A few other such compilations are listed in this page, section VII. 1 - 4. 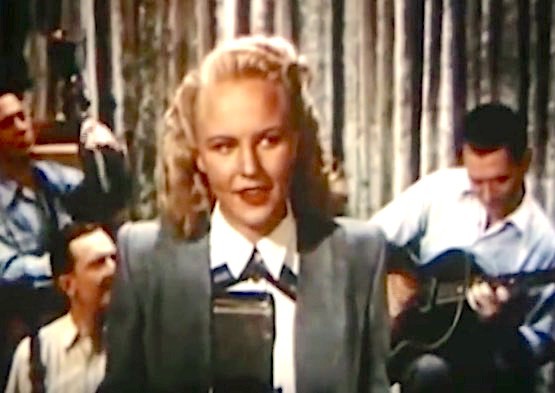 Title: Midnight Serenade / Note: Peggy Lee did her first film acting role in this 18-minute short, released by Paramount in 1947. Here is Paramount's official synopsis for the short: "Disc jockey resents pal's love of sponsor's daughter. Puts romance on the air. Trick backfires and lovers get together." 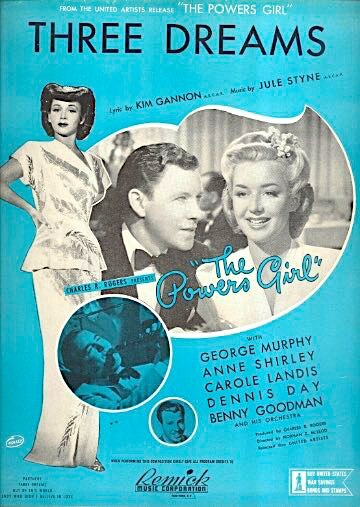 According to fellow fans who watched it decades ago (I never have), leading man Richard Webb plays a record engineer, and the plot is set in a recording studio. 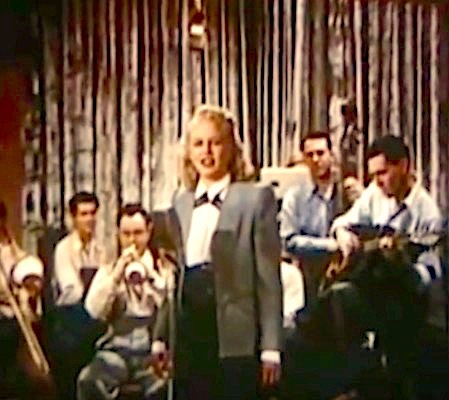 Peggy Lee sang 4 numbers in this short: "I'm In The Mood For Love," "It's A Good Day," "You Was Right, Baby" and "Sugar." 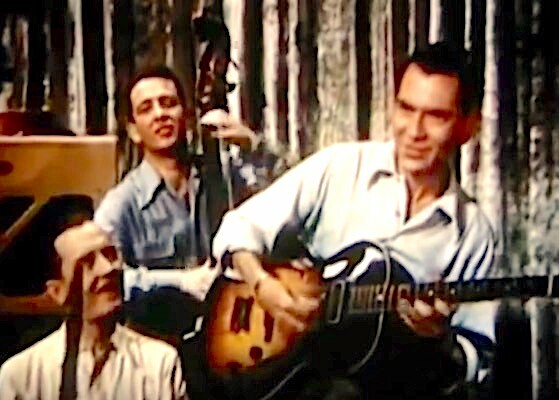 Only "Good Day" is well-known to fans, thanks to its inclusion in the VHS anthology Jazz Ball -- not to say anything of the dozens of ensuing VHS and DVD releases which have pirated the contents of that 1958 item. 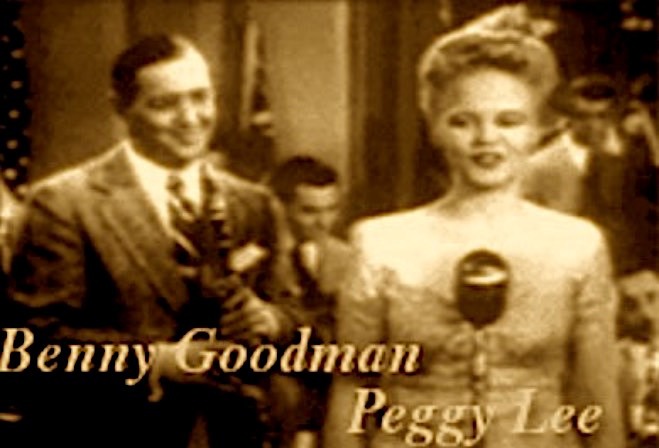 "It's A Good Day" can be seen in the legitimately released VHS/DVD Fever; The Music Of Peggy Lee, too. 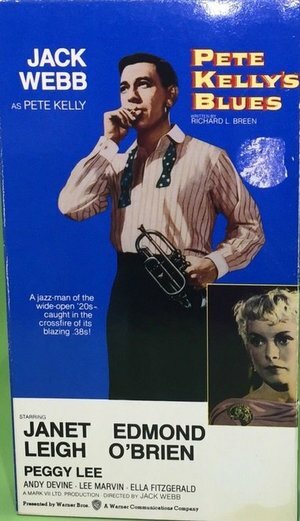 As for releases of the entire short on commercial VHS or DVD, Midnight Serenade has never enjoyed that privilege, except for the one aforementioned "It's A Good Day" segment. 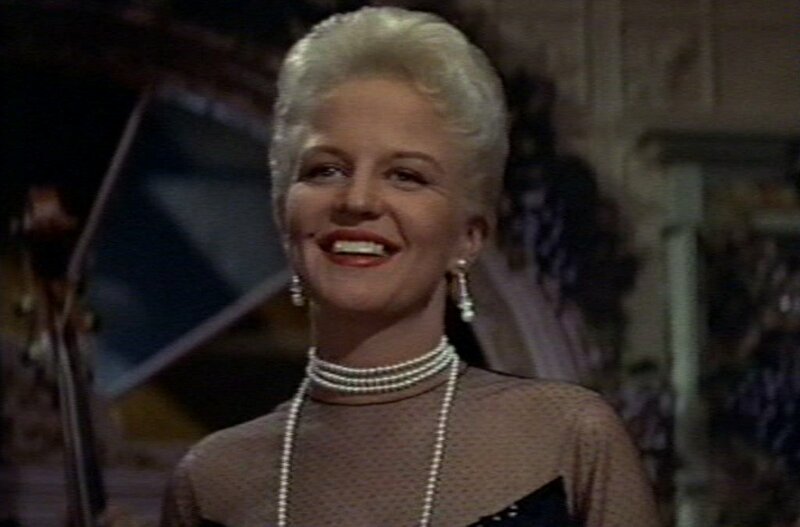 In addition to Midnight Serenade, Peggy Lee also appeared in a short named Banquet Of Melody, but she did not play an acting role in that one. For further details, consult the Music Videos, TV Hosting And Film Shorts page. 1- 4. 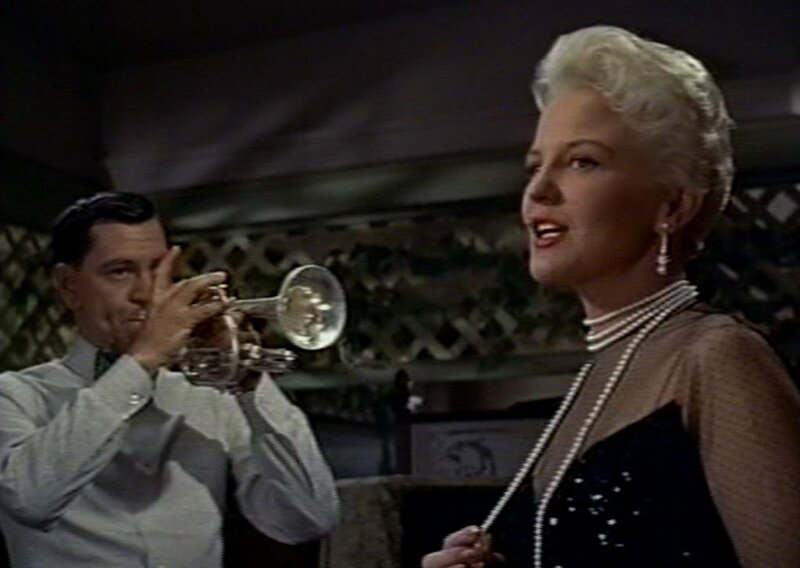 Title: Mr. Music / Note: In this 1950 Paramount film, Peggy Lee makes a cameo appearance during a party scene. 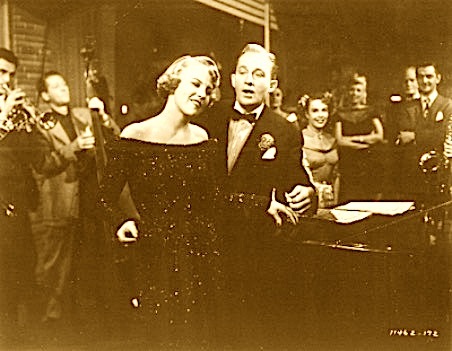 At the party, she and male lead Bing Crosby perform the song "Life Is So Peculiar" as a duet. The first image is a photo from the party scene. 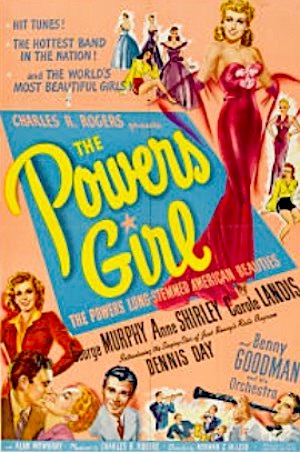 The ensuing images display movie posters and advertisement. 8. 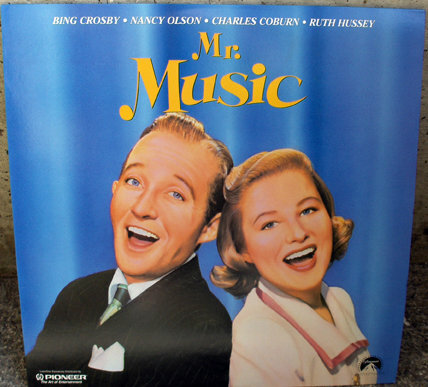 In 1950, Bing Crosby and Decca Records released a Mr. Music 10" LP (Dl 5284), containing not the soundtrack songs, but re-recordings made by Crosby and company for the music company to which he was contracted. 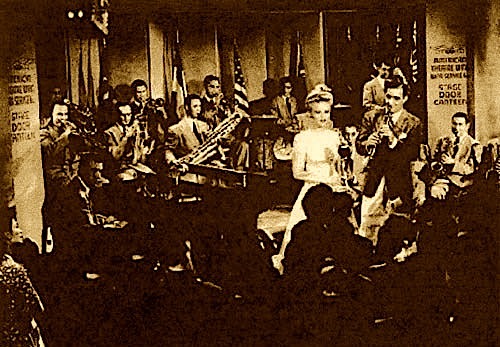 Since Peggy Lee was signed to Capitol at the time, she could not participate in this Decca project. The Andrews Sisters were enlisted to sing her vocal parts in the Decca version of "Life Is So Peculiar." 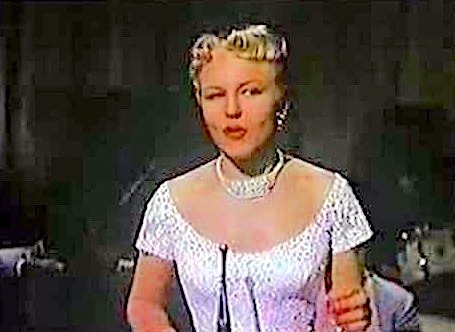 Peggy Lee did record the song solo (not in duet) for Capitol, which issued it on a single. 1-3. 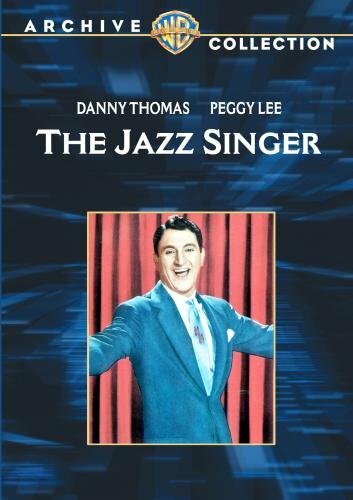 Title: The Jazz Singer / Note: In this 1953 Warner Bros. remake of the Al Jolson 1927 classic, Peggy Lee plays leading lady opposite Danny Thomas. Image #2 shows the movie's two stars, posing for the press. 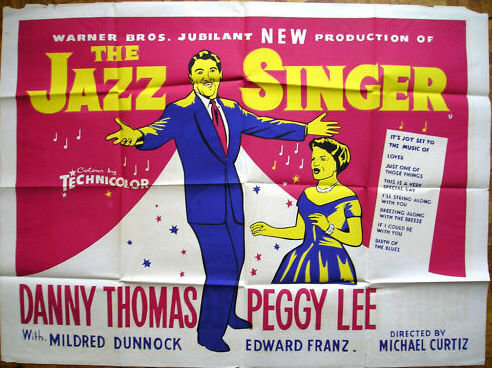 Since both leads play professional or aspiring vocalists in the movie, Thomas and Lee do a fair amount of singing throughout. 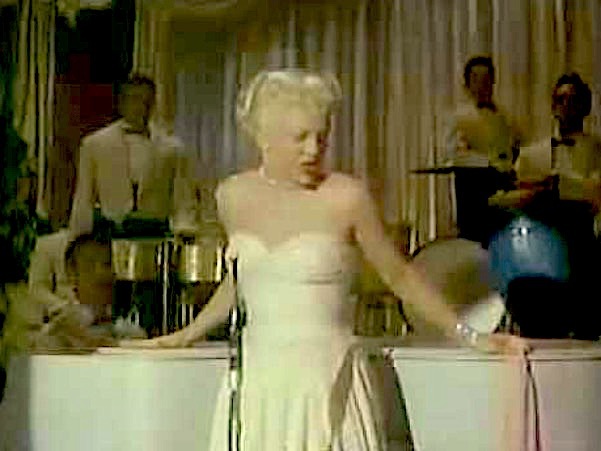 At her niteclub act and elsewhere, "Judy Lane" is seen performing "Lover" (image #1), "Just One Of Those Things" (image #3), "This Is A Very Special Day," and "I Hear The Music Now." Lee and Thomas are also part of "What Are New Yorkers Made Of?," a group number. 4. 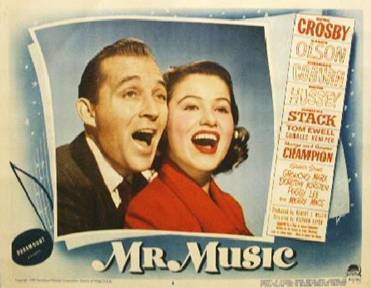 This movie poster lists some of the songs heard in the film. In the white rectangle to the left of Lee's image, three of the numbers that she sings are listed first, beginning with her hit "Lover." 7. 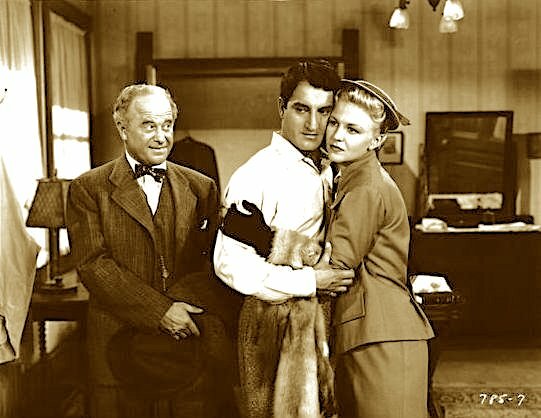 In this still from the movie, Peggy Lee and Danny Thomas are accompanied by character actor Tom Tully. 1 - 9. 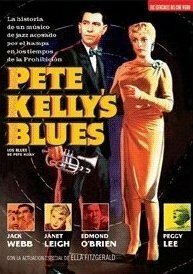 Title: Pete Kelly's Blues / Note: Peggy Lee plays a gangster's mistress and past-her-prime singer in this 1955 film, produced by Jack Webb's company Mark VII and distributed by Warner Brothers. Webb was the movie's director and male lead, too. 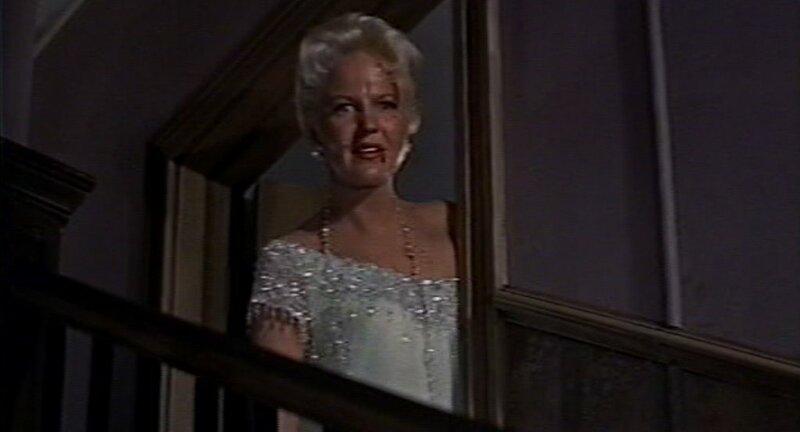 Above, "Rose Hopkins" is seen rehearsing "He Needs Me," and "Sugar" (images #2 and #3). 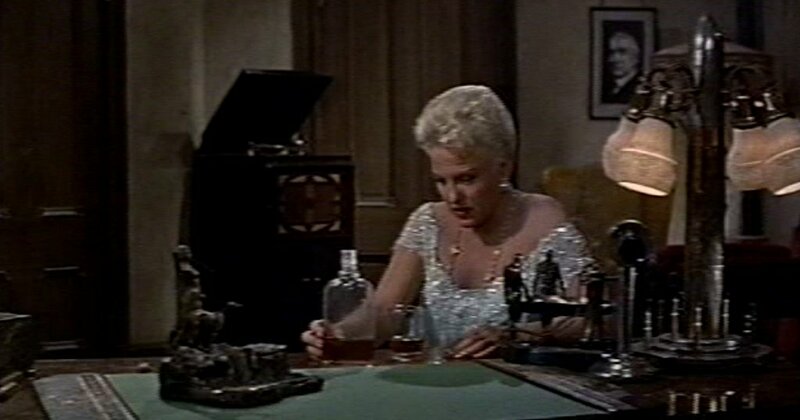 An alcoholic who eventually becomes insane, the character sings some of her numbers while in a precarious state. Inebriation has taken over her in the scene from which images #6 and #7 stem, dementia in image #9 ("Sing In Rainbow"). 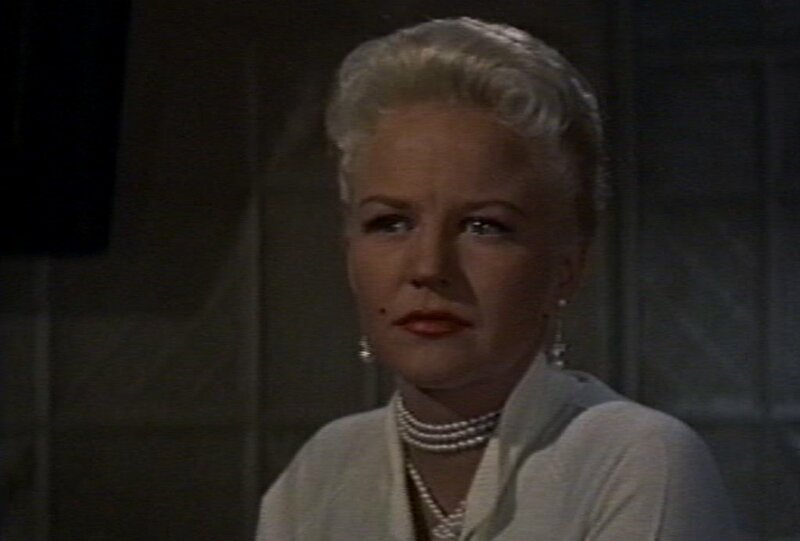 Peggy Lee earned a "Best Supporting Actress" Academy award nomination for this role. 11. 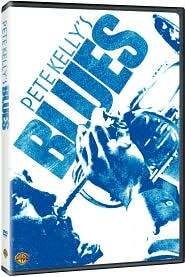 Title: Pete Kelly's Blues / Format: VHS / Label: Warner Brothers / Cat. Num. : unknown / Rel. Year: unknown / Note: May be a foreign edition. 12. 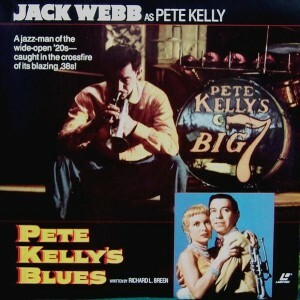 Title: Pete Kelly's Blues / Format: Laser Disc / Label: Warner Home Video / Cat. Num. : 11736 / Rel. Year: 1991 / Note: Due to the fact that I do not own a copy of this laser disc, I have gathered all details about it from online websites. I am somewhat doubtful about a couple of those details. Since the alleged catalogue number is the same one as the VHS (#11), I'd have expected both the laser disc and the VHS to date from around the mid-1980s. Also, I once saw an online auction for a DVD with the exact same cover as this laser disc, but at the present time I am not finding corroboration of that DVD's existence. 13. 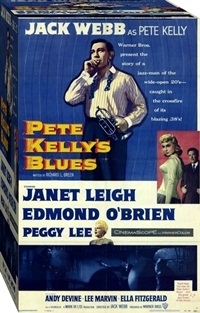 Title: Pete Kelly's Blues / Format: Laser Disc / Label: Warner Brothers / Cat. Num. : (United Kingdom?) Tvl 019 / Rel. Year: unknown / Note: "Original Cinemascope ratio version." 15. 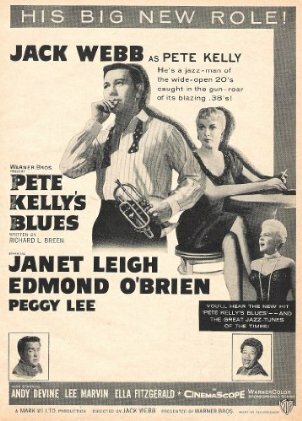 Title: Pete Kelly's Blues / Note: Movie advertisement. 16. Title: Fifty Years Of Film Music / Format: LP / Label: Warner Brothers / Cat. Num. : 3xxx 2736 / Volumes: 3 / Rel. Year: 1973 / Note: This set contains the Pete Kelly's Blues soundtrack versions of "Sugar" and "He Needs Me." 1-3. 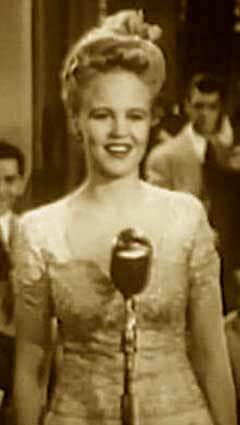 As shown in this page's previous entries, Peggy Lee appeared in only a handful of Hollywood films. There were a few additional projects which failed to materialize. 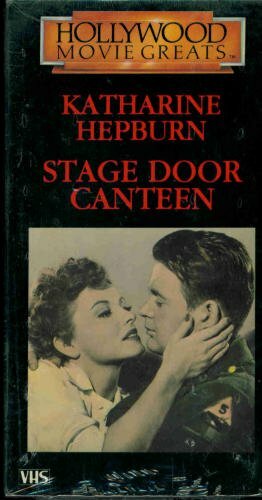 One of them was a movie opposite Cary Grant, slated to film in the early 1960s. Another was a biopic, developed by Lee herself in the early 1970s, about Debussy's mistress. 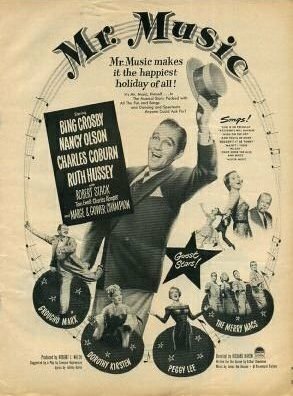 There was even a musical western whose working title was Pardners, with Bing Crosby and Hopalong Cassidy, in the early 1950s. 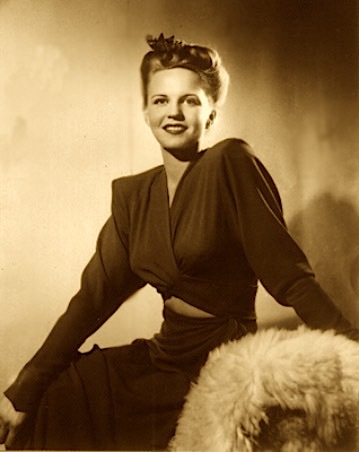 Peggy Lee had a few acting roles on television as well. 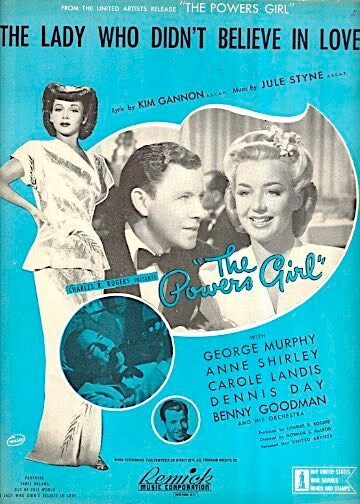 She was the female lead in So Deadly, So Evil, a 1960 episode from the weekly show General Electric Theatre (image #1). 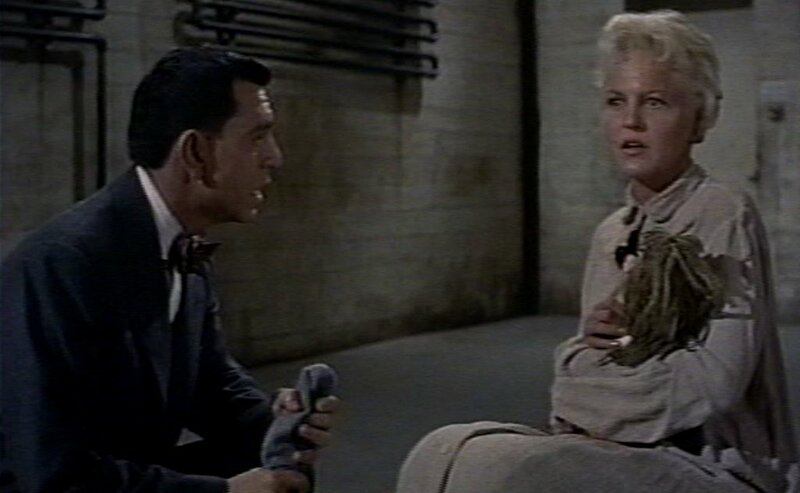 She campily played villainess Packer Jo in The Flats Furnace Flats Affair, a 1967 episode of the The Girl From U.N.C.L.E (a short-lived spin-off from the then very popular series The Man From U.N.C.L.E). 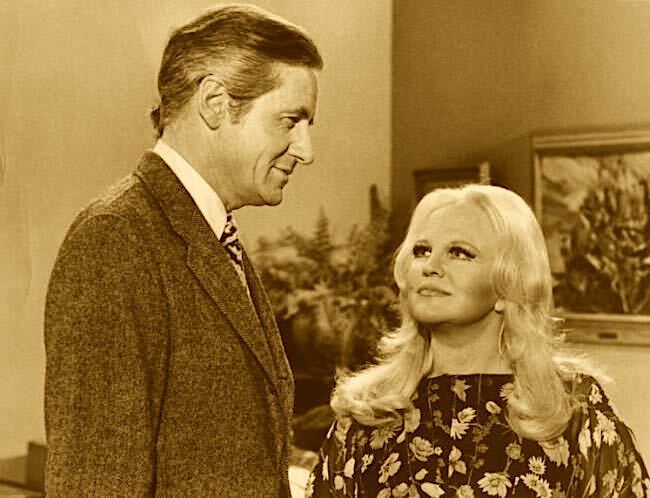 Furthermore, Lee made a guest appearance as the main client of Owen Marshall, Counselor at Law in a 1972 episode of that show, entitled Smiles From Yesterday (image #2). 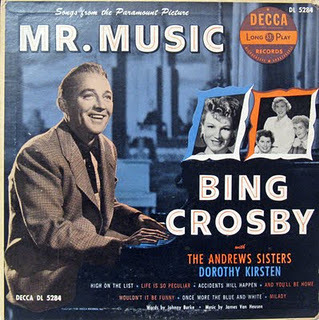 The vocalist did not sing in any of those dramatic roles, although she did record a theme song for the soundtrack of the Owen Marshall episode. 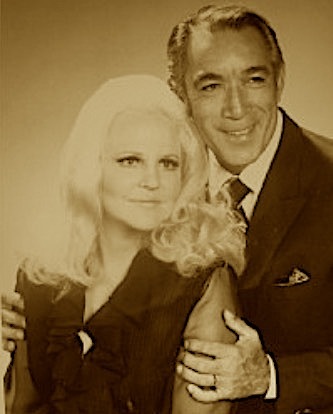 Lee also did two or three dramatic sketches with Anthony Quinn for their 1970 Kraft Music Hall special A Man And A Woman (image #3). Additional acting cameos took place in some TV variety shows, when the guest took part in those shows' comedy routines.